Der Spiegel has published an inane article about Europe's 10 Most Dangerous Politicians. Markus Söder, Bavarian Finance Minister: The politician from the Christian Social Union, the conservative sister party to Chancellor Angela Merkel's Christian Democratic Union, is known for his tub-thumping rhetoric and has stepped up a gear in the euro crisis with vitriolic comments about Greece. "An example must be made of Athens, that this euro zone can show teeth," he told the Bild am Sonntag tabloid newspaper this week. Alexis Tsipras, the leader of Greece's leftist Syriza party: In his latest proposal, Tsipras argues the Greek government should refuse to talk to the so-called troika comprised of the European Commission, the European Central Bank and the International Monetary Fund. He wants to "criminalize" the privatization of public enterprises. He has been labelled the "most dangerous man in Europe" since he became leader of the radical left and has been pressuring successive governments to abandon austerity measures that underpin Greece's continued access to international aid. Silvio Berlusconi, entrepreneur and former Italian prime minister: His Popolo della Libertà (People of Freedom) party supports current Prime Minister Mario Monti but is secretly preparing for Italian elections next year. Berlusconi wants to win a fifth term as prime minister with the help of populist anti-euro rhetoric. He recently said the Italian central bank should simply print more euros to avoid instructions from Brussels. He has also threatened to reintroduce the lira. Marine Le Pen, leader of the far-right Front National in France: The populist politician campaigned in this year's presidential election by warning about the supposed might of the EU. "Frau Merkel and her friends, Van Rompuy and the European Commission are in the final stages of creating a European Soviet Union," she thundered. "We are about to lose our status as a free nation." Timo Soini, leader of the True Finns party and a member of the European Parliament: Since the election, Finland has demanded that Greece provide collateral in return for Finnish aid. Soini wants that aid to stop. "Not a penny more," he says. "We've paid enough." Alexander Dobrindt, general secretary of the conservative Bavarian Christian Social Union (CSU): "It's the end of the line for Greece," Dobrindt said recently. Previously, he had demanded that the Greek government should no longer pay its civil servants and pensioners in euros but in drachmas. Nigel Farage, leader of the UK Independence Party (UKIP) and a member of the European Parliament: Farage is the man who can cause an uproar in the otherwise dull European Parliament, where he called the Lisbon Treaty "the most spectacular, bureaucratic coup d'etat that the world had ever seen." He has described European Council President Herman Van Rompuy as having the "charisma of a damp rag." Heinz-Christian Strache, head of the Austrian Freedom Party (FPÖ): Strache claims that the permanent euro bailout fund, the European Stability Mechanism (ESM), will destroy "not only our state, but also our democracy and constitution." He says the ESM is tantamount to an ´Ermächtigungsgesetz, an allusion to the 1933 German law that allowed Hitler to rise to power. Geert Wilders, head of the Dutch Freedom Party (PVV): Wilders wants to see the return of the Dutch guilder and described the ESM as "a dictate from Brussels." Viktor Orbán, Hungarian prime minister: Orbán's statement that he would bow to Brussels' power but not to its arguments created considerable irritation. While the list does include some fascists and other questionable characters, the main "crime" against the collective group is they seek to end the euro. Der Spiegel's article on dangerous politicians is a good example of how clueless main stream media is. While some in the list are clearly facists like Orban and Le Pen, the media tries to discredit Nigel Farage by putting him in the same group. By the way Der Spiegel is considered a major respectable magazine. They all work for the EU. Reader Martin is exactly correct. In this regard Der Spiegel is not only clueless, but dangerous, because it fans myths that the eurozone can survive intact (it cannot), and the myth the euro is worth saving in the first place (it's not). Angela Merkel, Chancellor of Germany, deserves special mention. Merkel is widely blamed for not doing enough to keep the eurozone crisis from spreading. However, her hands are tied by constitutional issues as well as political issues within her coalition. Yet, every step of the way Merkel caved in to demands of those desperately attempting to save the unsaveable. Nothing is more dangerous that ranking politicians on a mission to do the wrong thing, hoping to preserve their legacy. Francois Hollande, president of France: Hollande is about to wreck France with a plethora of tax hikes, by rolling back retirement age, and a preposterous policy that would "Make Layoffs So Expensive For Companies That It's Not Worth It"
David Cameron, UK Prime Minister: Cameron refuses to call a vote on exiting the EU even though the UK is damaged by inane EU rules. Last December, Cameron almost gave in to ridiculous EU treaty changes but did not do so only because he was dead set against preposterous financial transaction taxes proposed by Brussels. Were it not for the financial transaction tax, it appears Cameron would have done the wrong thing. Jean-Claude Juncker, Luxembourg Prime Minister and head of the eurozone finance ministers: Juncker is famous for his quote "When it becomes serious, you have to lie". More recently, Juncker told another whopper "I Don’t Envisage, Not Even for One Second, Greece Leaving the Euro Area"
Mario Monti, technocrat Prime Minister of Italy. Monti was never elected, he was installed by eurocrats because he would support the euro. Herman Van Rompuy, European Council president: Van Rompuy spends his time flying all over Europe promoting discarded eurobond ideas. He seldom shows up in European Parliament. José Barroso, European Commission president: Farage describes Barroso as "delusional idiot and was a supporter of Chairman Mao"
Nigel Farage properly classifies Barroso as a "delusional idiot". The same applies to Herman Van Rompuy, and self-admitted liar Jean-Claude Juncker. In contrast, Chancellor Merkel is anything but a delusional idiot. Rather, Merkel is an extremely skilled, as well as widely respected if not charismatic leader, with a seriously misguided notion there needs to be a European nannyzone super-state. Worse yet, she appears willing to sell her soul and the future of Germany to secure that outcome. As noted above, nothing is more dangerous that ranking politicians on a mission to do the wrong thing, hoping to preserve their legacy. Without a doubt, Merkel's attributes make her the most dangerous politician in Europe. Der Spiegel labeled Farage Europe's 7th most dangerous politician. Check out the platform of UKIP, Farage's party. 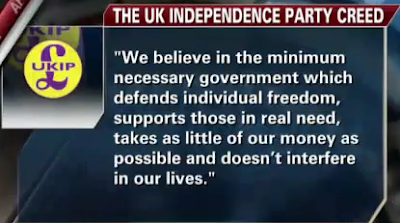 We believe in the minimum necessary government which defends individual freedom, supports those in real need, takes as little of our money as possible, and doesn't interfere in our lives. I think the Republican Party in the US should adopt that platform and that anything except a platform based on minimal government and individual freedom is dangerous.